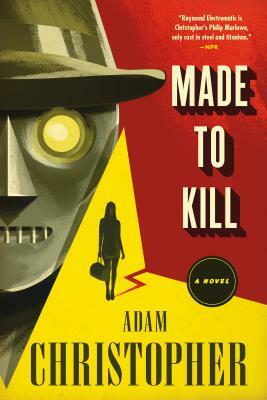 Made to Kill is a hard-boiled, pulp SF thriller with Ray Electromatic, the last sentient robot, cast as an analog Philip Marlowe, who solves cases by day and turns hitman at night, when his memory tape gets switched by his boss, a chain-smoking supercomputer named Ada. Rip off your E-ticket and take this thrill ride, filled with black comedy, sultry femmes fatales, Soviet spies, and secret weapons of mind control. At stake is nothing less than the American Dream, cast in false light upon a silver screen. I loved the way Christopher took the retro SF tropes and filtered them through the lens of Raymond Chandler, parodying Chandler’s language and gritty noir style while capturing its essence in his weird comic love note. The odd choice of setting the book in alt-’65, despite the fact that everything but the date screams 1940s, makes cold war fears and McCarthyism's chilling effect on Hollywood the real boogeymen of the story. As Ray hurtles down the Boulevard of Broken Dreams, the grit and glitter blow back from existential themes of moral culpability and identity, making this pulp fiction a worthy read. – R. J. Crowther Jr.
— Rob C. and Linda T.
It was just another Tuesday morning when she walked into the office—young, as I suspected they all might be, another dark brunette with some assistance and enough eye black to match up to Cleopatra. And who am I? I'm Ray, the world's last robot, famed and feared in equal measure, which suits me just fine—after all, the last place you'd expect to find Hollywood's best hit man is in the plain light of day. Raymond Electromatic is good at his job, the lone employee of the Electromatic Detective Agency—except for Ada, office gal and super-computer, the constant voice in Ray's inner ear. Ray might have taken up a new line of work, but money is money, after all, and he was programmed to make a profit. Besides, with his twenty-four-hour memory-tape limits, he sure can keep a secret. Plunged into a glittering world of fame, fortune, and secrecy, Ray uncovers a sinister plot that goes much deeper than the silver screen—and this robot is at the wrong place, at the wrong time. Adam Christopher is a novelist and comic writer. In 2010, as an editor, Christopher won a Sir Julius Vogel award, New Zealand's highest science fiction honor. His debut novel, Empire State, was SciFiNow's Book of the Year and a Financial Times Book of the Year for 2012. In 2013, he was nominated for the Sir Julius Vogel award for Best New Talent, with Empire State shortlisted for Best Novel. His other novels include The Age Atomic and The Burning Dark.